Of course, it’s impossible for travellers to South Africa to remain oblivious to the fact that, despite the rise of ‘black diamonds’ (middle-class black folk), racial inequality persists here. Black and coloured townships face problems such as a horrific HIV/AIDS rate and xenophobic tensions caused by economic refugees from nearby countries. Nonetheless, South Africans are some of the most upbeat, welcoming and humorous folk you’ll encounter anywhere, from farmers in the rural north who tell you to drive safely on those dirt roads, to Khayelitsha kids who wish you molo (‘good morning’ in Xhosa). Another point of unity in the diverse country is that, in malls and minibus taxis, bush pubs and shebeens, two popular topics of conversation are the 2010 FIFA World Cup and recent political upheavals. Most people believe that hosting football’s mightiest tournament will be as great a moment for South Africa as its Rugby World Cup triumphs in 1995 and 2007. Zimbabwe is home to one of the world’s seven natural wonders, the world famous and spectacular Victoria Falls. AZimbabwe safari offers beautiful landscapes and fantastic wildlife viewing opportunities; situated between the mighty Zambezi River and the seasonal Limpopo. Prominent areas such as Victoria Falls town, also known as the adventure capital of Africa offer thrilling adventure sports such as white water rafting and bungee jumping from the Victoria Falls Bridge. Victoria Falls is the most visited destination in Zimbabwe and it also offers easy access to neighbouring countries like Zambia, Botswana and Namibia providing a complete and unique safari experience. 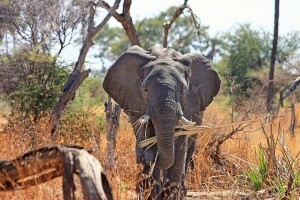 Significant parks that play an important role in the protection of wildlife in Zimbabwe include Mana Pools National Park, Hwange National Park, Lake Kariba, and Matusadona National Park, Matobo National Park and Malilangwe Wildlife Reserve as well as a few other smaller parks. Mozambique is situated in southeast Africa bordering the Mozambique Channel between South Africa and Tanzania. Mozambique is an untouched destination and offers some of the best dive spots in the world combined with 2500km of spectacular coastline and white sandy beaches; visitors can dive amongst colourful tropical fish and corals or sail along the shoreline. Mozambique is the ideal holiday destination for honeymooners, families or visitors seeking an adventure holiday. It offers intimate and romantic hideaways and secluded coves for snorkeling and swimming. The Garden Route is a coastal corridor on the western coast of South Africa, where ancient forests, rivers, wetlands, dunes, stretches of beach, lakes, mountain scenery and indigenous fynbos all merge to form a landscape of restorative beauty. Although it is the smallest of South Africa’s nine provinces, Gauteng (the Sotho word for “Place of Gold”), is the commercial and industrial powerhouse of the country and indeed of southern Africa. Gauteng is a cosmopolitan, multicultural mix of people from all walks of life, from all corners of the world. Gauteng’s main attraction is big business, but there is so much more … museums, galleries, historical battlefields. Gauteng is also an entertainment playground offering world-class restaurants, shebeens, shopping malls and music venues. Swimming with penguins at Boulders Beach on the Cape Peninsula, near Cape Town, is a real thrill. 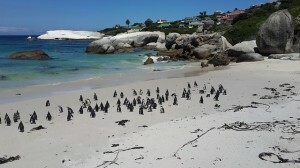 A small public beach is set apart from the main penguin colony that resides here (on Foxy Beach), but that doesn’t stop the penguins from sitting on your beach towel or darting around your legs while you take a refreshing dip in the Ocean. Penguins like to walk about and generally ignore fences. A boardwalk has been built around the dunes so you can get a great close up look at the entire colony eating, breeding, preening, swimming and chatting away. Limpopo is the northern most province in South Africa, bordering onto Moçambique, Zimbabwe and Botswana. Limpopo offers a mosaic of superb scenic landscape, a fascinating cultural heritage, an abundance of wildlife species and many nature based tourism opportunities. Limpopo is a land of legends and myths and of ancient civilizations … Those in search of history will find many places of archaeological significance that yielded relics dating back millions of years. The Mpumalanga Grass and Wetlands region is a birding paradise. This serene region is located in the south eastern part of Mpumalanga and shares its borders with Swaziland, KwaZulu Natal and the Free State provinces. Highlights of the region include the hundreds of lakes and forgotten hamlets in the central area, rock formations and splendid scenery of the imposing mountains. Situated just outside Ohrigstad are the spectacular Echo Caves. These mysterious caves were discovered in the 1920’s by the owner of the farm. After his cattle mysteriously disappeared on the farm he started looking for answers. That is when he discovered the Echo Caves. After exploring the cave, the discoverer realized that this is a gift from nature laid among the gentle undulating hills of the Mpumalanga escarpment. South Africa can be visited comfortably any time. However, depending on what you plan to do, it’s worth paying attention to the seasons, which are the reverse of those in the northern hemisphere. Winter (June to September) is cooler, drier and ideal for hiking and outdoor pursuits. Because vegetation is less dense and thirsty animals congregate around rivers and other permanent water sources, winter is also the best time for wildlife-watching. In the eastern highveld, nights are often crisp and clear, with occasional frosts, so come prepared with a jacket. The 2010 FIFA World Cup takes place from 11 June to 11 July, with the quarter- and semi-finals and the big showdowns taking place in Johannesburg (Jo’burg), Cape Town and Port Elizabeth from 2 July. Some 350,000 fans of the beautiful game are expected to descend on South Africa for the tournament, so travellers will have to book ahead to get beds and also seats on transport – particularly in the larger cities, where most matches will take place. Prices will also rise in line with the increased demand. More of a consideration than weather are school holidays. From mid-December to January, waves of vacation-hungry South Africans stream out of the cities, with visitors from Europe and North America adding to the crush. The absolute peak is from Christmas to mid-January, followed by Easter. At this time, accommodation in tourist areas and national parks is heavily booked, and prices can more than double. If you visit Cape Town, the Garden Route or other popular areas during this time, it’s essential to book accommodation in advance. On the plus side, the high summer months offer some great festivals, including Cape Town’s Kaapse Klopse. Spring (mid-September to November) and autumn (April and May) are ideal almost everywhere. Spring is also the best time to see vast expanses of the Northern Cape carpeted with wildflowers. The Rand is the legal tender and official currency of South Africa. The Rand was introduced in 1961 with the establishment of the Republic of South Africa, supplanting the South African Pound as legal tender at a rate of 2 Rand per Pound. One Rand can be divided into 100 cents. The Rand is available in banknotes of 10, 20, 50, 100, and 200 Rand denominations. It is also available in 9 coins in 1c, 2c, 5c, 10c, 20c, 50c, R1, R2, and R5 denominations. Make sure you are in possession of a full valid passport. This must be valid for a minimum of six months beyond the date of your EXIT from Africa. You also need to ensure you have enough blank pages (free of any stamps) to cover each country on your trip. As a general rule allow one page per country although South African authorities require a completely clean blank double page spread. It is not usually possible to use more than one passport for the duration of the tour.